This is a chemically varied group of meteorites composed mainly of FeNi metal with small amounts of other minerals and trace elements. The magmatic iron meteorites (e.g., IIAB, IIIAB, and IVA) formed within ~0.51 m.y. after CAI formation when short-lived radionuclides were extant. 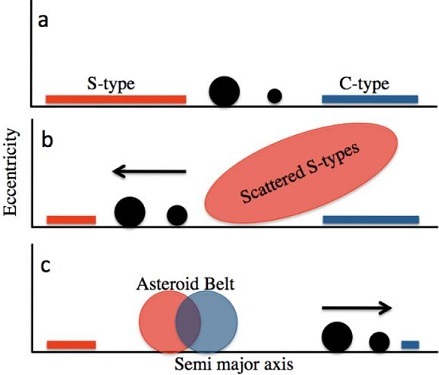 They formed in the cores of small, 6400-km-diameter, partially to completely differentiated asteroids, although some are more consistent with formation in small impact-melt pools distributed within relatively small parent bodies. Other iron groups (e.g., IAB, IIE), commonly termed "non-magmatic", have members that experienced only low degrees of igneous activity in which the metallic component was partailly melted and the silicate component exhibits a wide range of texturesfrom ultrametamorphism to incipient melting to differentiation (Ruzicka, 2014). Some IIE irons and a number of ungrouped irons (e.g., Sombrerete, Tucson) contain fractionated silicates. The accretion and differentiation of these iron parent asteroids predated chondrule formation and their formation of chondritic asteroids. 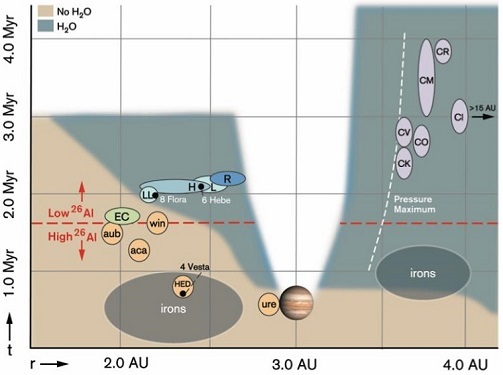 Iron meteorites have been resolved into 13 distinct chemical groups, with an "anomalous" or "ungrouped" designation given to the approximately 15% of irons with certain elemental abundances that plot outside of the normal ranges of the main groups (see descriptions below). The main groups are resolved based on a congruence in the percentages of nickel (Ni) and certain trace elements, mainly germanium (Ge) and gallium (Ga). These two are especially useful because of their wide range across the entire iron spectrum, but narrow range within specific iron groups. Some other elements used to resolve groups are iridium (Ir), copper (Cu), cobalt (Co), and gold (Au); each resolved group (and some subgroups) represents an origin from a unique asteroid accreted in a unique nebular region. The occurrence of either positive or inverse correlations among the ratios of Ge, Ga, Ni, and Ir serves as a useful grouping determinant. Likewise, the consistent variation of certain elemental concentrations in the irons provides a basis for grouping. Another useful, but less precise, grouping method is based on similarities in the macrostructure of etched irons, and is influenced by the bulk nickel content of taenite in association with the cooling rate. This feature primarily categorizes irons as either hexahedrites, octahedrites, or ataxites. In a study of W, Mo, and Ru isotopes in iron meteorites, Kruijer et al. (2017) recognized the existence of two distinct iron groups: those which accreted inside the orbit of Jupiter where thermal processing occurred under reducing conditions ('non-carbonaceous'), and those which accreted outside of its orbit where thermal processing occurred under oxidizing conditions ('carbonaceous'); the difference in redox conditions is attributed to differences in the ice, dust, and gas abundances (see also open access EPSL article by Budde et al. , and LPSC abstract #2720 by Worsham et al. ). Kruijer et al. (2017) recognized that both of these reservoirs were coeval and remained spatially separated within the protoplanetary disk for a prolonged period (~ 3.64.8 m.y., inferred from timing of CR and CB parent body accretion, respectively) due to the rapid growth of proto-Jupiter (~30 M⊕ core at 2.93.2 AU within the first 0.6 m.y. ; Desch et al., 2018). It has been posited that after Jupiter had grown to a massive size (>50 M⊕) by ~4 m.y. at an initial heliocentric distance of ~3 AU, it underwent a chaotic migration in a 3:2 (or 2:1) resonance with Saturnfirst inward for ~100 t.y. to ~1.52.0 AU while clearing the inner disk of planetesimals, and then outward for 500 t.y. ultimately ending at its current location near 5.2 AU (and Saturn near 7.1 AU); this is known as the "Grand Tack" scenario (Walsh et al. 2011, #2585; Johnson et al., 2016; Brasser et al., 2016). In accord with the "Nice Model" (Gomes et al., 2005; Tsiganis et al., 2005; Morbidelli et al., 2005), the final outward migration of the four (or five) gas planets occurred after dissipation of the gas and dust composing the protoplanetary disk. This led to the scattering of existing planetesimals from the carbonaceous reservoir into the inner Solar System where some of this material acquired orbital stability in the outer asteroid belt (Pierens et al., 2014). Kruijer et al. (2017) determined the ε182W values for representative iron meteorites, which reflect the timing of metalsilicate differentiation on their respective parent bodies. Based on coupled Mo- and W-isotopic diagrams (see below), they demonstrated that irons from groups IAB, IC, IIAB, IIE, IIG, IIIAB, IIIE, and IVA (and IIG; Wasson and Choe, 2009; A. Rubin, 2018) are associated with the non-carbonaceous reservoir (NC), in which iron parent bodies experienced earlier accretion (<0.4 m.y. after CAIs) and core formation (~ 0.31.8 m.y. after CAIs). 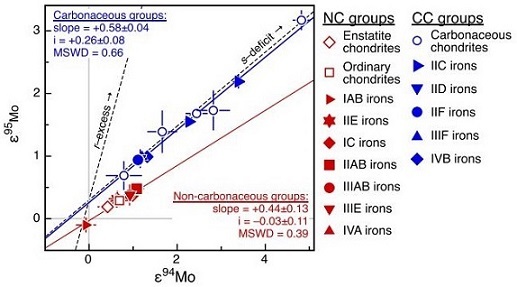 By contrast, irons from groups IIC, IID, IIF, IIIF, and IVB are associated with the carbonaceous reservoir (CC), and their parent bodies experienced a later accretion (~1 m.y. after CAIs) and core formation (~ 2.22.8 m.y. after CAIs). Alan Rubin (2018) recognized that the CC irons are enriched in refractory siderophile elements and attributed this to the inheritance of refractory metal nuggets initially present in CAIs. The enrichment in Ni observed in CC irons compared to NC irons was considered to reflect in part the higher oxidizing conditions that existed in the outer solar system where CC irons accreted. However, in an expanded sampling of ungrouped irons conducted by Spitzer et al. (2019, #2592), no significant difference in Ni content was found to exist between irons from the two reservoirs. It was also demonstrated by A. Rubin (2018) that CC irons generally have significantly higher CRE ages than NC irons, consistent with their location in the outer asteroid belt and thus greater distance traveled prior to intersection with the Earth. He also found that there are generally fewer members in the CC iron groups compared to the NC iron groups, which is likely a factor of i) a smaller core volume for CC iron asteroids due to later accretion, less differentiation, and perhaps most importantly, a higher oxidation state resulting in less production of metal, and ii) greater fragmentation experienced by CC iron meteoroids given their longer transit times in space. Furthermore, he posited that most ungrouped magmatic irons would derive from the CC reservoir, as are the two which had been adequately analyzed up to then, Mbosi and Grand Rapids. In their analysis of Mo, W, and Pt isotopes for ungrouped irons, Spitzer et al. (2019) found support for this latter hypothesis of Rubin (2018), as they determined that more of the ungrouped irons originated from the CC region compared to the NC region reflecting a ratio of 8:5. In addition, they ascertained that those originating from the CC region generally have negative Δ17O values while those from the NC region have positive values. Nucleosynthetic anomalies for several elements have been shown to support the dichotomy between the NC and CC regions, including O, Cr, Ti, Mo, W, and Ru. Nanne et al. (2019) analyzed Ni isotopes for irons from several CC chemical groups and found an ~60 ppm 58Ni excess for these irons compared to those from the NC chemical groups (see diagrams below). They attribute the NCCC dichotomy to a late infall to the inner protoplanetary disk of material depleted in supernova-derived nuclides such as 54Cr, 50Ti, 58Ni, and r-process Mo, at a time when the Jupiter gap prevented efficient exchange between the two isotopically-distinct disk regions. Thus, the present CC region in the outer protoplanetary disk preserves for the most part the initial disk isotopic composition established through enrichment in supernova-derived nuclides, and exemplified by the earliest formed material, CAIs. This group, associated with the non-carbonaceous reservoir, is one of the most well represented groups of iron meteorites, including the majority of irons that contain silicate inclusions; most of these silicates have nearly chondritic compositions. As evidenced by an IXe age of ~4.56 b.y., a high retention of planetary-type noble gases, and the small size of the precursor taenite crystals, group IAB irons cooled rapidly below temperatures necessary for isotopic exchange a very short time after formation. This suggests a non-magmatic origin without undergoing significant fractional crystallization. The implication is that the parent body was never in a fully molten state, and that the observed metalsilicate fractionation occurred during accretion, during an impact-melt event, or more likely, in distinct impact-generated melt pools. Worsham et al. (2017) argue that some IAB irons formed through a crystal segregation process (e.g., sLL, sLM, sLH), and in others this was followed by fractional crystallization of remaining melt (MG, some members of sHL and sHH, and ungrouped members). Cooling rate data and other studies suggest that this body may have experienced a catastrophic breakup and reassembly event which mixed various lithologies (Benedix et al., 2005). Trace element studies show that Ge is positively correlated with Ga, and inversely correlated with Ni. Another resolving characteristic is the proportionally higher contents of Ge and Ga for a given Ni content compared to other meteorites. The Thomson (Widmanstätten) structure seen in this group is commonly coarse, but spans the range of structures from hexahedrites to ataxites. Inclusions of troilite, graphite, and cohenite can be abundant. The similarity of group I irons with respect to Ge/Ga ratios and O-isotopic compositions compared to those of carbonaceous chondrites suggests that this iron group may have originally formed from metal-rich carbonaceous chondrite material similar to CR and CH material. However, through modeling of highly siderophile element abundances, Worsham et al. (2017) derived the initial melt compositions of MG and sLL members which revealed a strong consistency with LL chondrite Chainpur. On the other hand, Worsham et al. (2017) determined that the initial melts for the sLM and sLH subgroup irons were only broadly chondritic. They contend that their precursor material possibly experienced nebular volatile fractionation, and that they likely derive from parent bodies distinct from that of the MG. In addition, they suggest the sHL irons also likely derive from a distinct parent body (sHH irons have not been isotopically resolved). The close similarities that exist among all of these iron groupings suggest a formation from similar chondritic material on one or more parent bodies through independent impact processes affecting distinct melt pools. The fact that a large concentration of sHL members has been found near Erfoud, Morocco is consistent with the scenario that this subgroup, or at least a subset therein, derives from an impact-melt pod. Impact melting leading to the redistribution of volatile elements and reduction of metallic Fe could have produced the compositional differences found among the silicated irons. In an isotopic investigation of three IAB irons, Dey et al. (2019) demonstrated that while the ε54Cr values for the iron component plot in the winonaite field, values for the silicate component plot in a distinct region on an OCr coupled diagram. From these results they ascertained that the IAB silicated irons formed through an impact-generated mixture comprising iron from a winonaite-related parent body and silicate from an unrelated and otherwise unsampled parent body. It was recognized by Wasson (2011) that the pairs of groups consisting of [sLH and sLM], [MG and sLL], and [sHH and sHL] might be merged into just three groups if future studies of these IAB-related subgroups cannot be better resolved. In fact, Worsham and Walker (2015, 2017) found that the sHL member Sombrerete has a much more negative Δ17O than typical IAB irons, and it is also clearly resolved from the IAB main group and the other subgroups through Mo isotope systematics and HSE abundance patterns. Furthermore, they found that a member of the sHH subgroup (ALHA80104) was also resolved from the IAB complex, and it was concluded that the sHL and sHH subgroups derive from one or two distinct parent bodies in a separate nebular region from that of the IAB complex irons. In another study of the IAB subgroups, employing precise Mo, W, and Os isotope data along with HSE and other literature data, Worsham et al. (2017) ascertained that the IAB complex irons represent at least three distinct parent bodies and at least three impact-generated metalsilicate segregation events (see schematic diagram below). Previously, an arbitrary boundary was established to separate the IA and IB subgroups; those members with low Ni contents and Ge contents above 190 ppm were designated group IA, while those members with high Ni contents and Ge contents below 190 ppm were designated group IB. 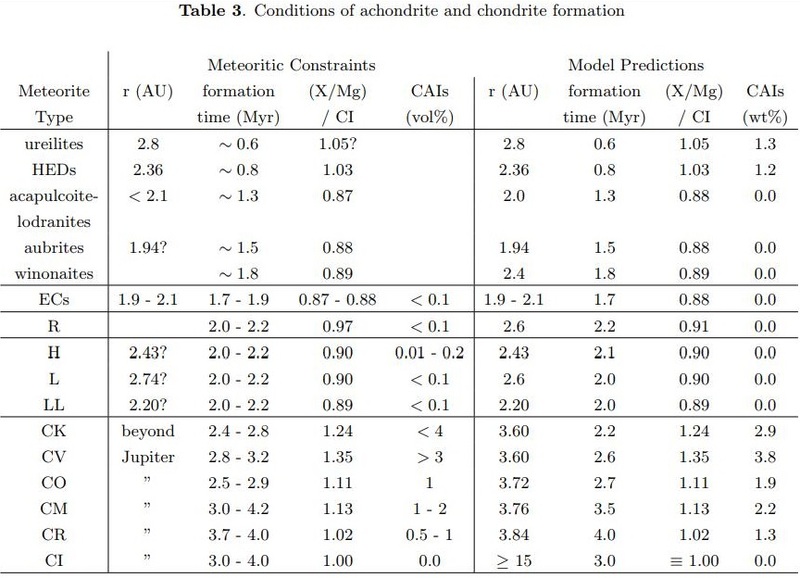 Additionally, extrapolation of Ni and other elemental trends defined a continuum for the IAB and IIICD groups, suggesting they originated from different sections of a common parent asteroid. The silicate inclusions in this group are closely related to the group of meteorites known as winonaites, and it is considered likely that both share a common parent body; Worsham et al. (2017) contend that winonaites are associated with the MG/sLL parent body. This group was incorporated into the IAB iron-meteorite complex (Wasson and Kallemeyn, 2002). Despite the wide range of Ge and Ga contents among members of the IIIC and IIID groups, plots of these two elements with Ni produce a smooth curve. In addition, similarities in their cooling rates make it likely that they originated on a common parent body. The trends for these two groups suggest a non-magmatic origin without fractional crystallization just as in the IAB group. Cosmic ray exposure ages of IIIC members are ~700 m.y., while those of group IIID are ~200 m.y., suggesting a two-stage breakup event involving separate regions of a common parent body. A defining characteristic of group IIICD members is the presence of the carbide haxonite. The members of the combined IIICD group are best resolved from the low-Ni IAB members based on Ni/Ir relationships since Ir shows more variation at lower Ni concentrations. This resolves the two groups well at higher Ni concentrations but fails to resolve them at the lower concentrations. Extrapolation of Ni and other elemental trends defines a continuum for the IAB and IIICD groups and it is probable they originated on a common asteroid. The occurrence of certain very high Ni members within the resolved IABIIICD group is explained by crystal settling in small, meter-sized, Ni-rich, impact-melt pools (see the Canyon Diablo page for an alternate scenario). However, most impact-melt pools cooled without experiencing this type of fractionation process. The most current taxonomic scheme proposed by Wasson and Kallemeyn (2002) for the IABIIICD irons can be found in the IAB section above. The members of this small group are resolved from the IIIC group based on their high Ni contents (16.6% to 22.6%) compared to IIIC members (<13%). IIID members also have a more balanced ratio of Ge to Ga, with absolute values of Ge, Ga, and Ir much lower than those of IIIC members. Structurally, group IIIC and IIID members are all finest octahedrites with the exception of those IIID members having the highest Ni contents. In these meteorites, an ataxite structure is found. This is a small, structurally diverse group that is associated with the non-carbonaceous reservoir. It plots close to the IAB field but has a lower elemental abundance of Au and As. Most members of this igneous group contain abundant cohenite. Group IIA is associated with the non-carbonaceous reservoir. It consists of single-crystal hexahedrites in which Ni, Ge, and Ga are positively correlated with each other, and inversely correlated with Ir. The large range in Ir contents among groups IIA and IIB is consistent with an efficient fractional crystallization model, while the continuity in the bulk compositions of both groups is consistent with derivation from a common magma source. A common origin is further supported by their similar cosmic-ray exposure ages. An arbitrary boundary separating these two igneous groups was once proposed using an Ir content of 1 PPM, but this artificial division is no longer considered to be meaningful. Low degrees of trapped melt are manefest as FeS nodules. 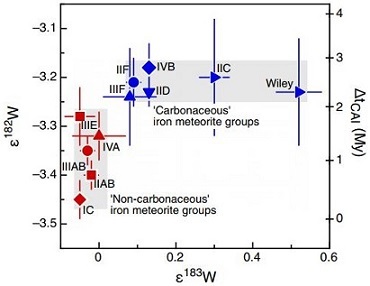 The similarity of group IIA Ge/Ga ratios with that of carbonaceous and enstatite chondrites suggests that this iron group formed from similar precursor materials, but O-isotopic studies have not yet been conducted. Recently, group IIG iron members have been shown to be chemically similar to those of the IIAB iron group, forming extensions to IIAB trends on elementAu diagrams (Wasson and Choe, 2009). The IIG irons are thought to have crystallized in a lower, P-rich realm of the evolved IIAB core (see IIG description below). Group IIB members exhibit the Thomson structure of a coarsest octahedrite. In contrast to the correlations in IIA, there is a positive correlation between Ge, Ga, and Ir in IIB, and an inverse correlation with Ni. There is both a continuity in composition and a similarity in cosmic ray age among groups IIA and IIB, which suggests a genetic relationship (i.e., same parent body) exists. An inverse correlation exists between the cosmic ray exposure (CRE) age and the Ir content. This fact can be explained through a scenario whereby Ir is concentrated at depth, and members of group IIB were closer to the surface where they were stripped from the asteroid first, thus establishing a correlation between a higher CRE age and a lower Ir content. The discovery in 2000 of the iron meteorite Guanaco, which has a chemical composition similar to that of a grouplet of four previously found iron meteorites known together as the Bellsbank Quartetnamely, Bellsbank, La Primitiva, Tombigbee River, and Twannbergsatisfies the requisite number of five members to establish a new iron chemical group, thereupon designated IIG (Wasson, 2004). Members of this group are structurally hexahedrites transitional to coarsest octahedrites (HOgg), representing the most Ni-poor and schreibersite/P-rich samples of any iron group. Group IIG members are chemically most similar to members of the IIAB iron group, forming smooth extensions of IIAB trends on elementAu diagrams consistent with fractional crystallization. It has been proposed by Wasson and Choe (2009) that formation of IIG irons occurred inside isolated cavities which remained after crystallization of an evolved IIAB magma. After the loss of significant immiscible S, the P/S ratio of the IIAB magma approached parity, at which point the P-rich IIG magma was able to begin to crystallize. IIG iron crystallization likely occurred in the lower regions of the IIAB core, while an immiscible and buoyant S-rich melt collected at the upper region of the chamber. Certain elements like Au and Ge were likely removed along with the S-rich melt phase, while the low-Ni content of IIG irons may be attributed to diffusion and redistibution of Ni out of metal and into schreibersite during the core's extended cooling history. Group IIC is associated with the carbonaceous reservoir. It consists of plessitic octahedrites in which Ni, Ge, and Ga are positively correlated with each other. Ni is inversely correlated with Ir. This group appears to have undergone igneous fractionation in the core. 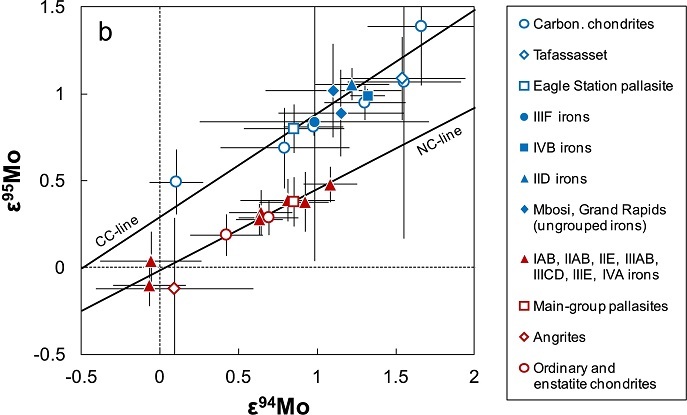 Compared to all other meteorite groups, both IIC irons and CR chondrites have significant δ183W excesses, have elevated δ15N, and share similar Mo isotope systematics, and therefore a genetic link is inferred (Kruijer et al. (2017; Budde et al., 2018). This is the fourth largest magmatic iron group and is associated with the carbonaceous reservoir. Ni, Ge, and Ga are positively correlated with each other, and inversely correlated with Ir. Members are enriched in refractory and volatile siderophiles, but have a low S content. This contradictory condition is best explained by a scenario in which this group underwent slow internal heating through the decay of short-lived radionuclides, which produced igneous fractionation in the core, resulting in a very high Ga/Ge ratio and a schreibersite-rich composition (Wasson and Huber, 2006). As temperatures slowly increased, all of the S was entrained within an FeS-rich melt, which separated to form a core. As temperatures continued to increase, a second P-rich melt formed and drained through the S-rich layer establishing a new inner core a few km wide, from which the group-IID meteorites would eventually originate. Eventually temperatures began to cool, and the inner and outer cores became immiscible, with a diffusional barrier developing between them. Based on cooling rate comparisons, the IID parent body was ~40100 km in diameter, or about 10 times larger than the IIC parent body. As with group IAB-IIICD, the IIE parent body is associated with the non-carbonaceous reservoir and was never completely molten. It is likely that the globular, Fe-rich silicates were mixed with metallic melt during impact-heating events. These events produced rapid heating of the chondritic silicates, with temperatures reaching higher levels than in IAB-IIICD melts due to lower contents of C and S (having melt-inducing properties) in IIE melts. Consistent with these higher melting temperatures for IIE irons are the differentiated and completely segregated silicates that form droplets rather than clasts. The higher temperatures are also responsible for much lower levels of planetary-type rare gases than which are found in the IAB-IIICD group. A wide variation in cooling rates is observed among IIE members, indicative of cooling at a broad range of depths within the parent body; consequently, there is no typical structure for the IIE group. Studies of the IIE group members by McCoy (1995) and Ikeda et al. (1997) led them to divide it into two metamorphic typesprimitive/unfractionated (Netshaëvo, Techado, Watson) and evolved/fractionated (Miles, Weekeroo Station, Kodaikanal, Colomera, Elga). Based on bulk metal compositions and O-isotopic ratios, it is considered likely that IIE meteorites were derived from an "HH" chondrite parent body (J. T. Wasson, 2017). Compositional and isotopic data derived from silicates and chromite grains in relict chondrules in IIE Netschaëvo support an origin on a parent body distinct from the H chondrites (Schrader et al., 2017). Group IIF is associated with the carbonaceous reservoir. Resolution of this group is based on several factors including structure, which ranges from ataxitic to plessitic, an unusually high Ge/Ga ratio, a high Ni content, a high Co and Cu content, and a low P content. The compositional trends are most consistent with igneous fractional crystallization of a core. Contrary to accepted theory, the Ni content is positively correlated with the Thomson (Widmanstätten) structure bandwidth. This occurrence could be explained by either differences in the cooling rate or by the effects of bulk P content on bandwidth growth. Oxygen-isotope data indicates a relationship exists between the IIF irons, the Eagle Station pallasites, and the CVCKCO carbonaceous chondrites, with formation occurring in the outer solar system. Group IIIAB irons are associated with the non-carbonaceous reservoir. They are the most represented group of magmatic iron meteorites, accounting for almost a third of all known irons. Compositional, structural, CRE age, and cooling rate data all provide convincing evidence in support of the theory that groups IIIA and IIIB originated on the same parent body. The Ni content of group IIIA and IIIB members forms a continuous sequence between the groups. The Ge content of IIIA members overlaps that of IIIB members. In spite of the fact that these two groups have different structures (IIIA has mostly coarse textures while IIIB has mostly medium textures), and that they are negatively correlated with respect to Ge/Ni and C/Ni, they are considered to be genetically related. The compositional differences are likely due to late-stage chemical interactions during fractional crystallization involving mixing of different zones of the core. A fractional crystallization model (Powell and Chabot, 2011) demonstrates that as the S content increases in the ever-shrinking metallic liquid component, trace elements are highly depleted in this liquid; the best fit for S concentrations in IIIAB irons is ~12%. The IIIAB group members share a similar cosmic ray exposure age of ~650 m.y., signifying a single breakup event at this time. Notably, a genetic relationship between groups IIIAB and IIIE has been posited based on Cu isotopic systematics (Bishop et al., 2012). An arbitrary boundary has been established dividing the IIIA and IIIB subgroups. Group IIIA members have a Ni content at the low range from 7.1 to 8.6%, while group IIIB members have a Ni content at the high range from 9.2 to 10.5%. The main-group pallasites have metal compositions and O-isotopes which are nearly identical to those of an evolved, high-Au, high-Ni IIIAB melt following ~80% crystallization of the core. It was once considered plausible that both main-group pallasites and IIIAB irons originated on a common parent body. However, metallographic cooling rates of these pallasites are not what one would expect given an origin at the coremantle boundary, but instead, they are 20× slower than those of IIIAB irons. Moreover, the ReOs chronometer demonstrates that main-group pallasites formed 60 m.y. later than IIIAB irons, raising further doubts about a IIIAB coremantle origin for these pallasites. Equally important, pallasites have a much younger range of CRE ages than the IIIAB irons (Huber et al., 2011). This group is associated with the non-carbonaceous reservoir. In spite of its close similarities to the IIIAB group, resolution of this small group has been made based on its unique Ge,Ga,Co,Au,As/Ni and Ga,Co/Au ratios, swollen kamacite band structure, presence of inclusions of the carbide haxonite, and lower CRE ages. These two groups have similar N and C isotopic compositions, as well as matching Cu isotopic systematics within error, and a genetic relationship has been posited to exist (Bishop et al., 2012). The two groups are marginally different in their C-isotopic composition and in their occurrence of the nitride carlsbergite. The precursor material of these two distinct parent bodies would have been almost identical in composition (Wasson, 2013). Group IIIF is associated with the carbonaceous reservoir. These low-Ni, low-Ge irons exhibit several characteristics which help to resolve this group from the others. They have an inverse correlation between Ni and Ge contents, very-low Co and P contents, and uniform cooling rates. Inclusions are rare in this structurally diverse group. Group IVA is associated with the non-carbonaceous reservoir. There is a positive correlation in the concentrations of Ge with Ga, and Ge with Ni in these irons which supports the designation of an independent group. The compositional trends are most consistent with fractional crystallization of a core. The low Ni content is thought to be a result of Fe dilution derived both from dissociation of FeS and by reduction of FeO (Wasson et al., 2006). A lower than normal Ge and Ga content for this iron group suggests their loss through high temperatures in an open system. Melting and differentiation of the iron and its subsequent drainage to form a core was possibly initiated by a large impact(s) onto a porous L/LL asteroid between ~20 and 160 km in diameter, rather than by radiogenic heating (26Al, 60Fe) alone (Wasson and Kunihiro, 2004; Kunihiro et al., 2004). Oxygen and Cr isotopic data supports a genetic connection between IVA irons and L/LL chondrites (Sanborn et al., 2018). 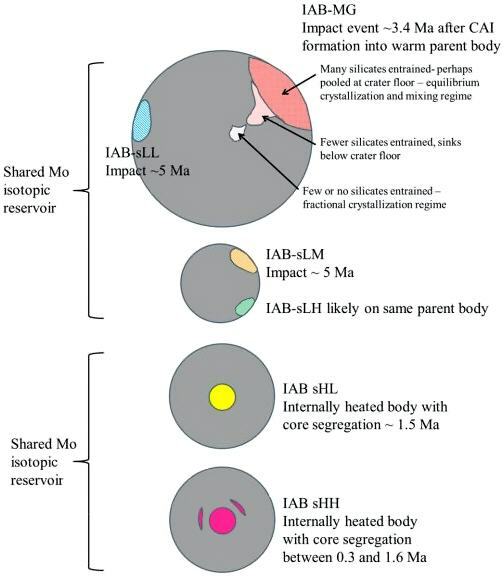 One scenario suggests that a catastrophic impact disrupted the IVA parent body mixing large core fragments with cooler mantle fragments, which produced the wide range of metallographic cooling rates observed. However, current studies by Wasson et al. (2006) dispute the possibility of this impact-scrambling model, and suggest instead that IVA irons experienced a typical cooling scenario with significant thermal gradients. Scott et al. (2011) envisage a body that had original dimensions of >600 km when accounting for all of the differentiated layers, but which subsequently lost its silicate mantle in a glancing collision 12 m.y. after CAI formation. The impact created a molten metallic body 200400 km in diameter which underwent rapid cooling at variable rates (50,000500,000K/m.y. ; McCoy et al., 2011). From this collisional disruption one or more smaller molten metallic bodies also formed and underwent an even more rapid cooling phase (e.g., EET 83230). A second severe impact ~20 m.y. later produced one or more fragments >30 km in diameter or perhaps a rubble-pile asteroid. A final impact 400 m.y. ago delivered m-sized fragments to Earth. Alternatively, Moskovitz and Walker (2011) argue that the cooling rates and the UPb closure age of the IVA parent body are consistent with an original diameter of only 110 km, and propose that it was internally heated by 60Fe. Later collisional events led to its breakup and the conversion of some orthopyroxene into clinopyroxene. Members of group IVA can be separated into high-Ni and low-Ni subsets, with an inverse correlation between Ni content and cooling rate. Almost all members of the IVA group exhibit a fine structure. Only three IVA members, Steinbach, São João Nepomuceno (SJN), and Descoberto, contain significant amounts of silicates, primarily orthopyroxene (ortho- and clinobronzite) and the silica mineral tridymite. The silicates are thought to have a cumulus origin and to have been mixed with metallic melt during an impact event (Ruzicka, 2014). Two other IVA irons, Gibeon and Bishop Canyon, contain veins of tridymite likely formed by vapor deposition of a silica-rich source. Burkhardt et al. (2008) propose that the metalorthopyrenesilica composition of Steinbach and SJN was formed by impact injection through fractures of the hot, solidified metal core; this core formed within ~1 m.y. after CAI formation. The IVB group is associated with the carbonaceous reservoir. These irons have the lowest abundances of volatile siderophile elements such as Ga and Ge. The group shows a positive correlation in the Ga and Ge concentrations, as well as Ge with Ni, which supports its designation as an independent group. Members of group IVB have an ataxite or plessitic composition with micron-sized kamacite spindles (forming a microscopic Thomson [Widmanstätten] structure) and associated phosphides, both of which are more abundant in the members with higher Ni contents. These irons have a very high enrichment in refractory siderophile elements, attributable to parent melt fractionation processes associated with formation of a cumulate core (Williams and Humayun, 2013). Group IVB irons experienced very high internal temperature conditions (1760K) which resulted in the strong depletion of volatile siderophile elements. In addition, approximately 72% of the Fe has been lost from the metal to the silicate through an oxidation process, which is responsible for the observed high Ni content. The compositional trends are most consistent with fractional crystallization from a low-S (~ 16 wt%) melt involving mixing of different zones of a core. Numerical models were employed by Neumann et al. (2018) to better understand the relatively late timing of metalsilicate separation (~2.9 [±0.6] m.y. after CAIs) inferred for IVB irons from HfW chronometry. They derived a preferred multi-stage differentiation scenario, a synopsis of which can be see on the Santa Clara page. Yang et al. (2009) determined that the varied CRE history of the IVB group, and the wide range of cooling rates measured for members of the group, are indicative of a multiple breakup of the parent body and/or removal of the insulating mantle. Goldstein et al. (2010) found that Ni concentration profiles measured along the kamacitetaenite interface attest to one of the fastest cooling rates among iron groups, but also reflect a wide range of cooling rates in a similar manner to IVA and IIIAB irons. However, in contrast to IVA and IIIAB irons, both of which are believed to have crystallized inwards following mantle removal, low-Ni IVB irons cooled more slowly than high-Ni IVB irons. This is consistent with concentric crystallization from the center outwards while temperatures were buffered by an insulating silicate mantle. That being said, to establish the wide variation in cooling rates that exists among IVB irons, the mantle would have to have been stripped prior to cooling below 600°C. Goldstein et al. (2010) and Yang et al. (2010) proposed that this impact event occurred while 25% of the outer core was still molten, and assert that IVB irons were derived from the 75% of the inner core that was solid, measuring 35160 km in diameter. The inner core completed its final solidification after mantle removal (and possibly removal of the remaining liquid core), as attested by the wide variation in cooling rates among IVB irons. The core in which IVB iron crystallization occurred was calculated to have been 110170 km in diameter on a pre-disruption asteroid that had measured 220340 km in diameter. The low-Ni IVB subgroup with the slowest cooling rate (475K/m.y.) was located near the center of the core, while the high-Ni subgroup that crystallized late and had the fastest cooling rate (5000K/m.y.) was located 62 km from the center. Interestingly, O-isotopic analyses (McCoy et al., 2017; Corrigan et al., 2017) has led to the determination that IVB irons share close similarities to the South Byron trio ironsMilton pallasite grouping, and also that these meteorites fall within the range of the oxidized CV chondrites. Further analyses based on Cr isotopes also supports a genetic relationship between these disparate meteorites (Sanborn et al., 2018). Based on Mo, Ru, and W isotopic compositions and HSE abundances, it was shown by Hilton et al. (2018) that, like IVB irons, the South Byron trio irons and Milton pallasite derive from an oxidized carbonaceous chondrite parent body. Furthermore, based on Mo isotopes, it has been ascertained that Eagle Station pallasites also derive from the carbonaceous reservoir; they are also similar to IVB irons with respect to Ni and Cr isotopes (Budde et al., 2016 and references therein). Notably, it was demonstrated by Sanborn et al. (2018) that Eagle Station plots nearest to the CK (and CO) chondrites in OCr space. Many other irons that occur singly or in assemblages of less than five members remain "ungrouped". About 85% of the ~1,000 irons in our collections fall into one of the 13 main chemical groups, while another ~8% constitute 20 small grouplets. The remaining ~7% of the irons might have originated on unique parent bodies. Of these ~100 unique parent bodies, ~20 represent irons of impact-melt origin on chondritic asteroids, while the others represent irons of igneous origin in the cores of differentiated asteroids. These irons probably formed from small melt pods of FeNi-metal within the silicate mantle of their parent body where complete melting did not occur. Silicate material was mixed with the viscous FeNi metal, cooling to form silicated irons. Most belong to the nonmagmatic groups IABIIICD and IIE. Group IIE silicated irons are related to the "HH" chondrites, while the unique silicated iron Steinbach is related to group IVA irons.